On January 1st, 2011 my grandparents celebrated their 67th wedding anniversary. Earlier today my sister posted a picture of them at the lunch she hosted in their honor and it got me reminiscing about my grandma in particular. Most of our conversations revolved around food and if we weren’t talking about it we were eating. I then began to think about Thanksgiving in particular and how the two of us would wait until we were certain that no one was paying attention and sneak into the kitchen and steal the crispy skin off the freshly roasted turkey. Inevitably, my dad and sister would always know what we were up to and join in. Today I craved this ritual and had to recreate it but without the carcass. This recipe is dedicated to my grandma and I have to say I think it is my best to date. My family decided this will be our new Thanksgiving ritual but why wait till then…enjoy it now. It’s as good a day as any to be thankful! Put aside 2 Tbsp pomegranate seeds and 1 clementine for use later. In a sauce pan over medium heat cook remaining pomegranate and sections of 2 clementines and apple cider vinegar. Mash fruit with potato masher. Add 1/4 water, 3 cloves and Triple Sec. Bring to boil. Remove from heat and strain keeping only the liquid. Put aside. In saucepan saute onion in Earth Balance until translucent. Add remaining pomegranate and clementine( cut clementine sections in half) and saute for 2 more minutes. Stir in reserved pomegranate clementine liquid, white vinegar, and sugar. Bring to boil. While its heating mix cornstarch & 2 Tbsp water in separate cup. When mixture boils slow stir in cornstarch mixture. Boil 4 minutes and remove from heat. Allow to cool. Place potatoes, vegetable broth, & garlic cloves in a large pot. Cover potatoes with water and bring to boil. Reduce to simmer and cook until potatoes become tender. Drain, keeping potato water for stuffing and gravy. Put potatoes back in pot. Add Earth Balance, sour cream, 1/4 cup potato water, seasoned salt, and nutritional yeast. Mash. Cover and set aside. In frying pan cook mushrooms in olive oil, 1 cup water, thyme and dill. When mushrooms are tender add Worcestershire sauce, Tamari, & potato broth. Bring to boil. In cup mix cornstarch with 2 Tbsp water. When mushroom sauce begins to boil slowly stir in cornstarch mixture. Turn heat to low. Saute onion and celery in 1/4 Earth Balance so onions are translucent. Chop baguette into bite size cubes and place in large mixing bowl. Add sage, salt, 1/4 cup Earth Balance to onions. Cook until butter is melted. Pour over bread. Add mayo and 1/4 cup potato water. Mix. This part is best to do with hands to get a feel of the texture. It needs to be moist enough to form into patties. Add more potato water if needed. If you run out of potato water you may use water. Bake for 10-15 minutes until golden brown. Do not rinse pan. Saute chicken-less strips in Earth Balance. Drop in fryer for 2 minutes at 350 degrees. I was trying to recreate a particular taste so I deep fried the strips, this is not necessary. If you choose not to simply saute till golden brown. Place a stuffing patty on the plate. Top with chicken-less strips, mashed potatoes, and gravy. 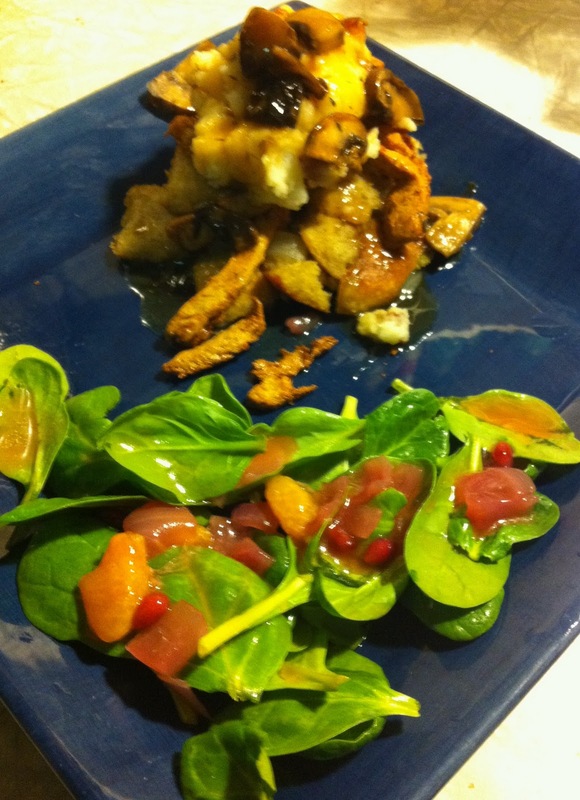 Garnish plate with baby spinach leaves covered in pomegranate clementine glaze. Gallery | This entry was posted in Gardein, holiday, Main Course. Bookmark the permalink.